Since 1911, Heartland Bank has been dedicated to providing financial resources and civic volunteers for community activities in the neighborhoods and towns where we are located. Community commitment takes many forms at Heartland, including seasonal community initiatives, charitable giving programs, and community outreach. We are not strangers to those communities where we have had a presence for years, and we welcome the exciting new endeavors ahead as we establish a new presence in up-and-coming local communities. Ultimately, we are neighbors helping neighbors - through our actions, donations and willingness to at least listen to the wants and desires of the communities we serve. Read about our local involvement and submit our Support Request form to start a conversation with us today! Committing with people and purpose! Complete our request form here! Looking For Us To Support You? Originally located in the Capitol Square Office building on East State Street in downtown Columbus in 2005, Heartland’s current Capitol Square branch is conveniently located at 101 S. High Street. 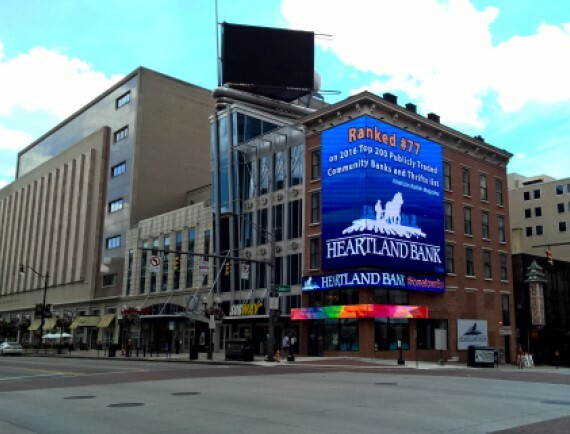 This red brick building boasts Heartland’s own 34’ x 42’ digital advertising billboard leading customers and visitors to Heartland’s doorstep. Be sure to visit on a weekday as this is our only branch that is not open on Saturday!